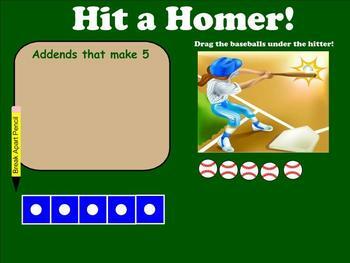 I use this Smart Notebook file to teach addition to first graders and improve basic number sense. You can use this in small groups or with the whole class. Students manipulate the objects to learn addition facts and build number sense. I have the class close their eyes while one student drags an item (baseballs, basketballs, watermelon eaters) under the the picture. Students then guess how many items disappeared. Using the pictures and number stick, students figure out the missing number and then write the equation. The kids love it! 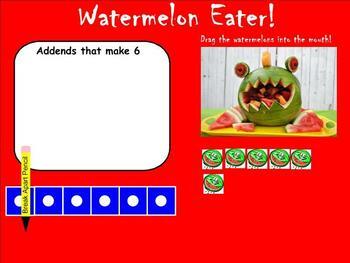 Lots of fun and it is solid for learning basic number sense!